16-30 % people experience blotting. 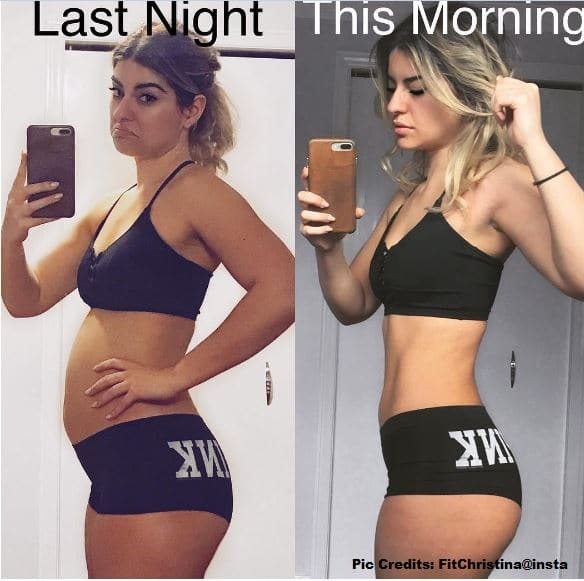 Bloating cause belly swollen, by the excessive gas production, due to the disturbance of movement of muscles of digestive system which increase pressure and increase your belly fats. It is usually caused when you stuffed the stomach with excessive / heavy foods. The pain and discomfort can be reduced by using some foods or ingredients you are intolerant to. For some people blotting is the serious medical complication, consult your doctor or consultant to rule out serious conditions. Drinking alcohol, wine and beer make your stomach bloated. Drinking alcohol suppresses anti-diuretic hormone, which cause loss of water from body and upset the sodium level in the body. The body tissues actively absorb water which led to water retention. These beverages has high amount of carbon dioxide, a gas. Intake of these beverages make the gas trapped in the digestive system which causes bloating and cramps. Beans and lentils are types of legumes which have high amount of proteins, carbs and fibers. They contain special type of carbohydrates which escape digestion and fermented by gut bacteria and produces gas as a byproduct. This gas can bloating, flatulence, cramping and diarrhea. Cruciferous vegetables include broccoli, cauliflower, cabbage, brussels sprouts etc. These vegetables also contained the type of carbohydrates that escape digestion and gas production which cause bloating. Cooking these vegetables make them easy to digest. Onions are used in cooking meals, side dishes and salads while garlic is used for flavor and health remedy. Some people are intolerant and sensitive to the compounds present in raw onions and garlic. Onions and garlic are source of fructans which are soluble fibers that can cause blotting, belching and digestive discomforts. Apples are high in fiber, vitamin C, antioxidant but the fructose fermented in large intestine are the major culprits of bloating and gas. About 75% of world population is lactose intolerant. In case you are lactose intolerant; dairy may cause blotting, gas, cramping, diarrhea and major digestive problems.